The Blood Angels Chapter and their successors mount a desperate defence of their home world of Baal from the predations of the tyranid hive fleet Leviathan. 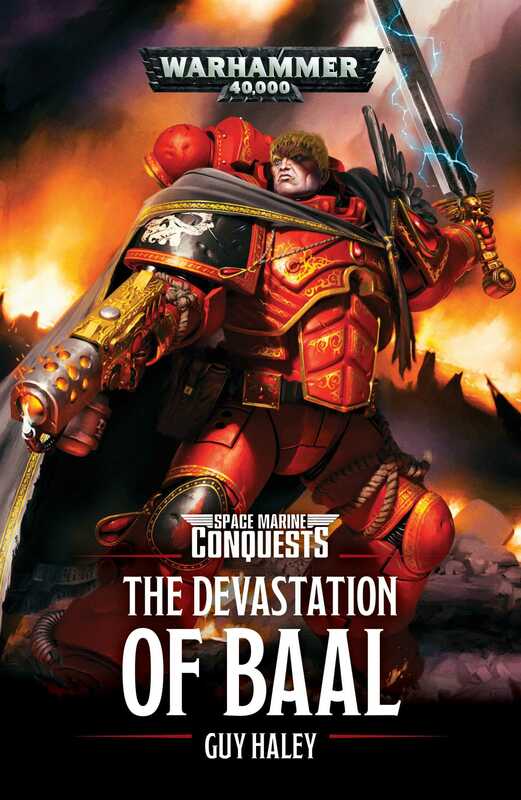 After a brutal campaign in the Cryptus System fighting the alien tyranids, Lord Dante returns to Baal to marshal the entire Blood Angels Chapter and their Successors against Hive Fleet Leviathan. Thus begins the greatest conflict in the history of the sons of Sanguinius. Despite a valiant battle in the void around Baal, the Blood Angels are unable to stop the tyranids drawing ever closer, but their petitions for reinforcements are met with dread news. The Cadian Gate, the Imperium’s most stalwart bastion against Chaos, has fallen. In their darkest hour, no help will reach the beleaguered Dante and his warriors. Is this truly then the Time of Ending? Guy Haley is the author of the Horus Heresy novels Titandeath, Wolfsbane and Pharos, the Primarchs novels Konrad Curze: The Night Haunter, Corax: Lord of Shadows, Perturabo: The Hammer of Olympia, and the Warhammer 40,000 novels Dark Imperium, Dark Imperium: Plague War, The Devastation of Baal, Dante, Baneblade, Shadowsword, Valedor and Death of Integrity. He has also written Throneworld and The Beheading for The Beast Arises series. His enthusiasm for all things greenskin has also led him to pen the eponymous Warhammer novel Skarsnik, as well as the End Times novel The Rise of the Horned Rat. He has also written stories set in the Age of Sigmar, included in War Storm, Ghal Maraz and Call of Archaon. He lives in Yorkshire with his wife and son.